So, even local weather forecasts have turned into a technological craft! This doesn't mean that it's out of our hands. Nowadays, we rarely find ourselves without internet, television, radio or a cell phone nearby. However, you never know when better knowledge of weather patterns and trends might come in handy. Weather forecasts; Meteorology and Climatology, are a complex science. Even so, understanding some of the basics, such as the cloud, is not beyond average capability. Cloud reading in particular, might come be useful for times when our dependency on such equipment may not be contented. Cloud reading is not only an enjoyable pastime; it is also the quickest and easiest method of predicting local weather. Generally, there are three major types of clouds and they are categorized by level of height in the atmosphere; as low, middle or high clouds. Knowing how to identify each type of cloud may help you to foresee what Mother Nature will have in store for the daily local weather forecast. Nimbostratus Cloud (rain-layered):The Nimbostratus clouds are almost always an indication of rain.They're grey and foggy-like withoutanydistinct shape or form. They also can be seen hanging very low to the ground and covering most of the sky. If you catch yourself under a blanket of this type of cloud, be sure to have an umbrella athand. 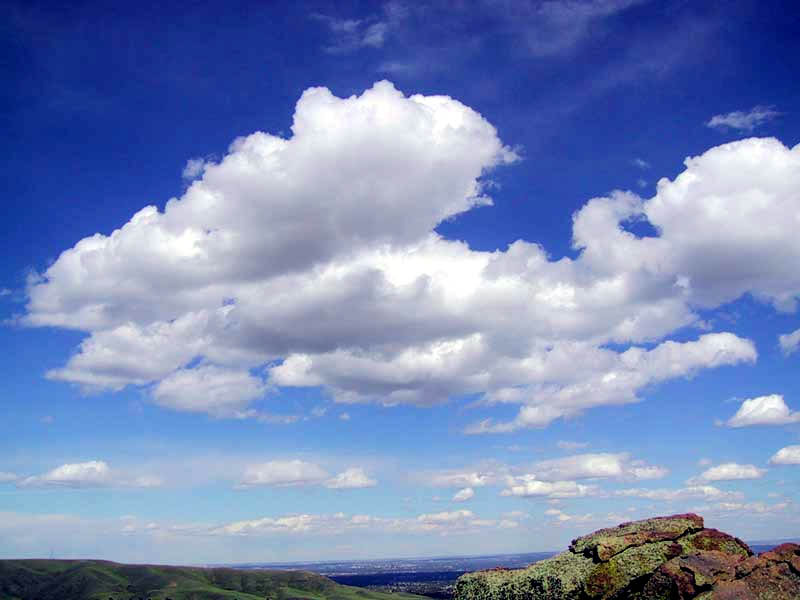 Cumulus Cloud (heap/pile): These are the most familiar of all the cloud forms. Meaning heap orpile in Latin,they are usually identified by their vertical development and clearly defined edges.They are often puffy with a cotton-like appearance. When small or medium sized, these clouds can often occur during fair weather. However they can continue to grow into Cumulus-Congestus clouds which may produce heavy rain, lightning, strong winds, hail, and even tornados. 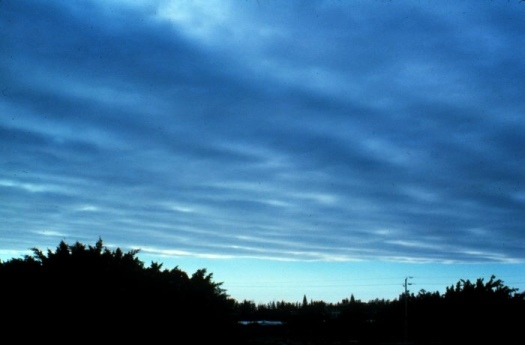 Stratus Cloud (layered): Meaning blanket or layered, may be used to explain a "cloudyday" and might beotherwiseknown as "above-ground fog". They are low to the ground and can vary in color from dark grey to almost white. Also, these clouds are usually transparent and can bring a light drizzle at most. Stratocumulus Cloud (covering-mass): These clouds are characterized by their large dark, rounded masses, usually in groups, lines and/or waves. As for climate, these clouds can bring light rain or even snow. However, they're often seen either before or after worse weather, so they may indicate storms to come. 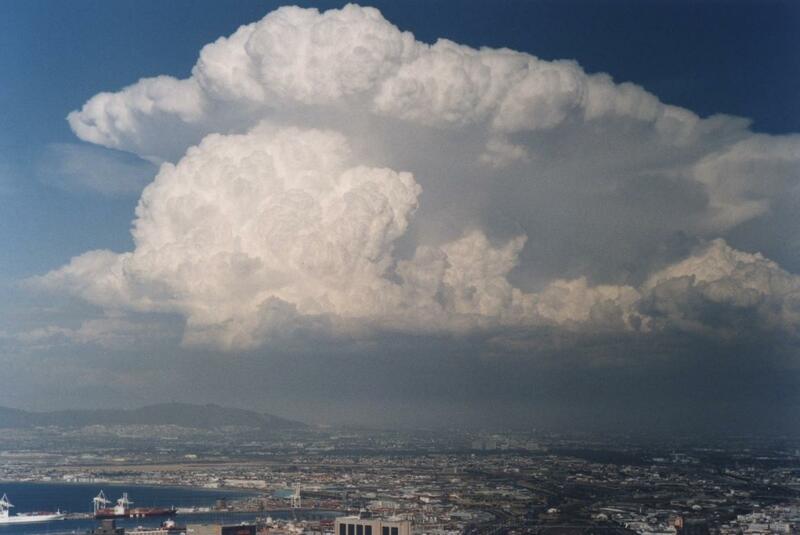 Cumulonimbus Cloud (heap, cloud/severe rain): When it comes to predicting any severe and extreme weathersuch as super-cell thunderstorms, these clouds are the most obvious. They are known for their mushroom-cloud resemblance and are easily visible from a long distance away. If you see any of these on the horizon, you can be sure trouble is on its way. 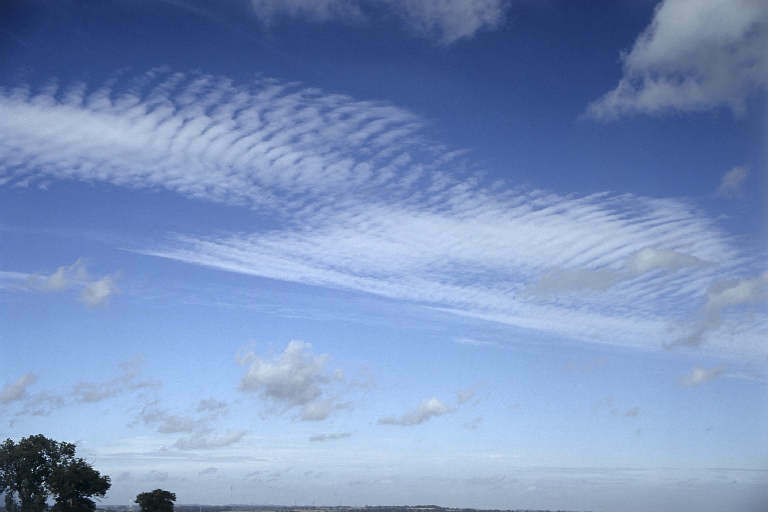 Altocumulus Cloud (high-heaped): Otherwise known as "Mackerel sky", these clouds have a similar appearance to the markings on an adultKing Mackerel fish. They are usually white or light gray and occur in sheets or patches with wavy, rounded masses or rolls. 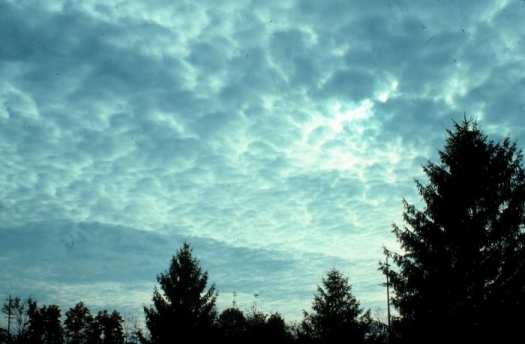 Altocumulus clouds often develop preceding a cold front. Likewise, their presence on a humid, summer morning frequently signals the possibility of thundershowers later in the day. 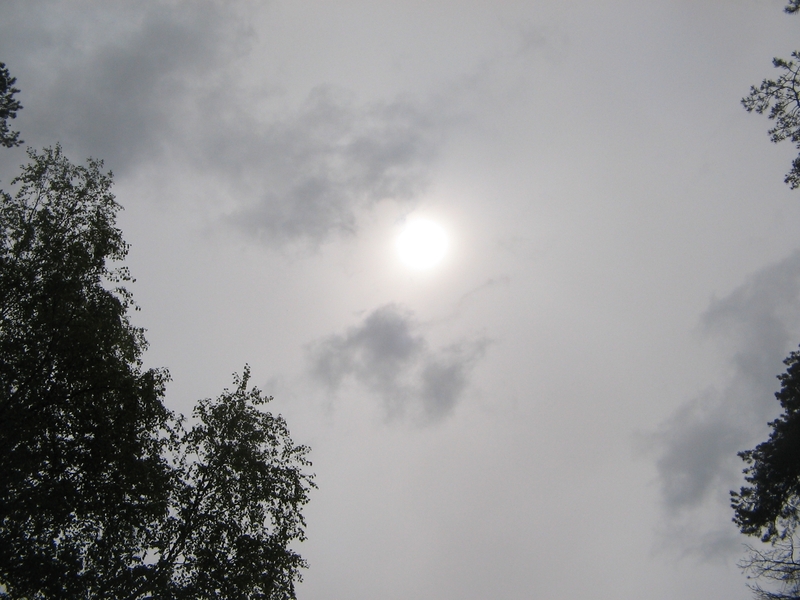 Altostratus Cloud (high-layered): Similar to the low Stratus clouds, these condensed vapors are made of icecrystals in the atmosphere.Theyare a result of lifted air masses that become compressed by incoming frontal systems. They are also dangerous to aircrafts because they can cause atmospheric icing or ice accretion. 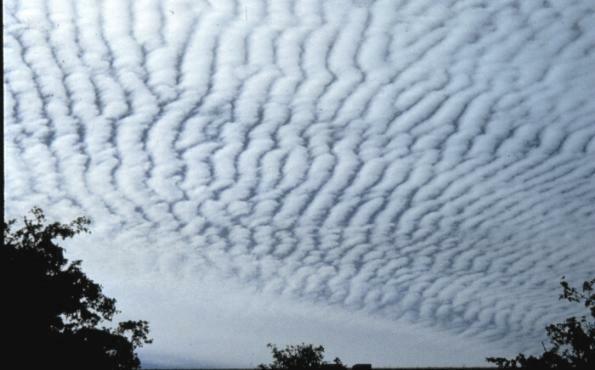 Cirrocumulus Cloud (curl of hair-heaped): The Cirrocumulus cloud is a high altitudecloud that resembles theAltocumulus with a distinctive veil-like or fibrous look. Like other Cumulus clouds, cirrocumulus clouds signify convection which is movement of fluids and/or gasses and vapors in the air. 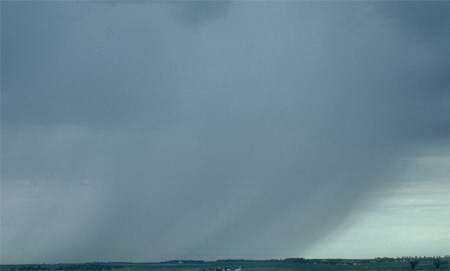 Occasional Virga or atmospheric precipitation, which evaporates before ever touching the lower levels of the troposphere, is the most of what a person on the ground might notice from these clouds. They are simply too high above the earth to have any direct impact on the weather we experience. Cirrus Cloud (curl of hair): If you ever notice a large amount of Cirrus clouds, it may be a sign of an approaching frontal system or upper airdisturbance which can imply climate changes in the near future. 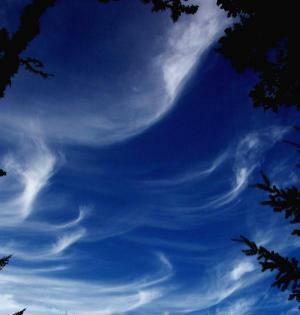 Cirrus clouds can also be the remnants of a thunderstorm. Also, a large shield of Cirrus and Cirrostratus typically accompany the high altitude outflow of hurricanes, typhoons and/or increasingly stormy weather. 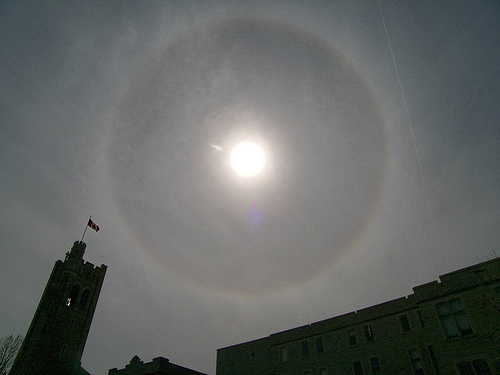 Cirrostratus Cloud (curl of hair-layered): These clouds are mostly composed of ice-crystals, thus indicating a large amount of moisture in the upper atmosphere. Like most other high altitude clouds, they don't generate any precipitation on ground levels but can sometimes be a warning of a soon approaching warm front which may lead to precipitation within the next 12 to 24 hours.